The Kingdom of Portugal began its life in 1139 when Afonso Henriques, Count of Portugal, was acclaimed King of the Portuguese. 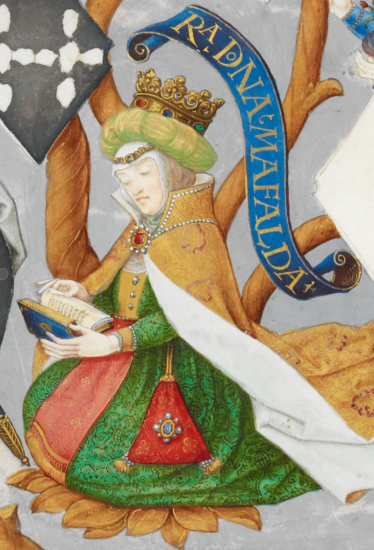 His wife was Matilda or Mafalda of Savoy, who was thus the first Queen of Portugal. They had seven children together, including his successor the future King Sancho I of Portugal. Sancho succeeded his father in 1185. He had nine surviving children with his wife, Dulce of Aragon and he also had two children with a mistress. Upon his death in 1211, he was succeeded by his eldest son, now King Afonso II of Portugal. Afonso had married Urraca of Castile in 1206, and they had at least four children together. He died at the age of 37 in 1223 and was succeeded by his eldest son, who became King Sancho II at the age of 12. Around 1240, he married Mécia Lopes de Haro but the marriage was unpopular, and they had no children together. A civil war broke out in late 1245 and Sancho fled into exile. He died in Sevilla in 1248 and was succeeded by his younger brother, now King Afonso III. Afonso’s first marriage to Matilda II, Countess of Boulogne had taken place in 1239, but they had no children and divorced in 1253. That same year, he remarried to Beatrice of Castile, an illegitimate daughter of Alfonso X, King of Castile. They had eight children together, though not all lived to adulthood. He also had around ten children with various mistresses. Upon his death in 1279, he was succeeded by his eldest surviving son, now King Denis of Portugal. He married Elizabeth of Aragon, and they had two children together. She was later canonised. He also had various illegitimate children. Upon his death in 1325, he was succeeded by his only legitimate son, now King Afonso IV. In 1309, Afonso IV had married Beatrice of Castile, and they had seven children together, though not all lived to adulthood. Upon his death in 1357, he was succeeded by his eldest surviving son, now King Peter I.
Peter had married Constanza Manuel in 1340, and they had two surviving children together. However, Peter fell in love with Constanza’s lady-in-waiting Inês de Castro and had three surviving children by her. Constanza died in 1345, and he later claimed to have married Inês in 1354. She was murdered in 1355. In 1357, he also fathered a son named John with a woman named Teresa Lourenço. Upon his death in 1367, he was succeeded by his eldest surviving legitimate son, now King Ferdinand I.
Ferdinand was supposed to marry a Castilian Princess, but in 1371, he married Leonor Teles. They had just once surviving daughter, Beatrice of Portugal. 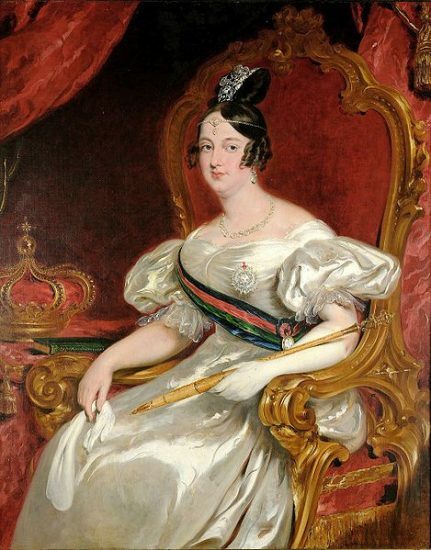 Upon Ferdinand’s death, Beatrice was supposed to succeed him, but the throne was seized her father’s illegitimate brother John, who became the first King of the House of Aviz. On 11 February 1387, John married Philippa of Lancaster, daughter of John of Gaunt, son of King Edward III, who was a powerful ally to him. They went on to have nine children together, though not all lived to adulthood. They became known as the illustrious generation. Upon John’s death in 1433, he was succeeded by his eldest surviving son, now King Edward. Edward had married Eleanor of Aragon in 1428, and they had nine children together, though not all lived to adulthood. 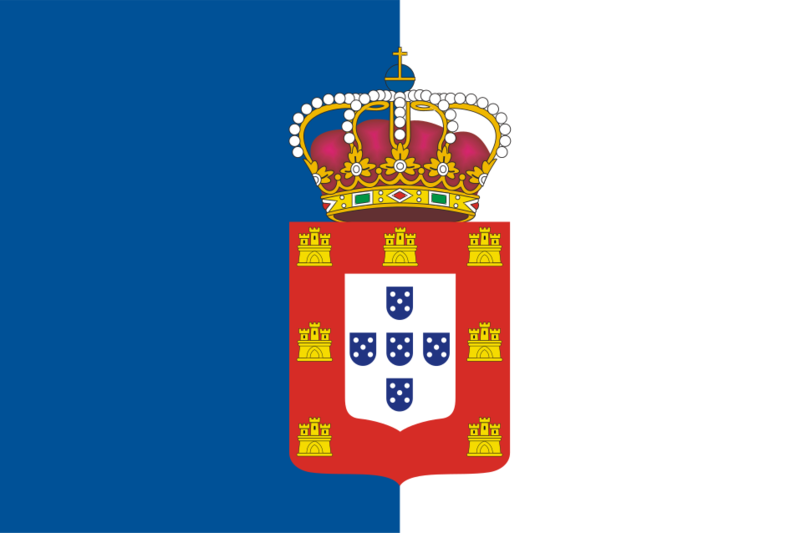 Upon his death in 1438, he was succeeded by his eldest surviving son, now King Afonso V. As he was just six years old, he was placed under the regency of his mother, but her regency was not popular. In 1447, he married Isabella of Coimbra, and they had two surviving children together, including The Princess Saint. 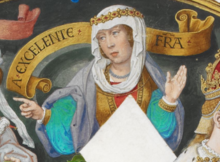 Isabella died in 1455 and in 1475, Afonso remarried to his niece, Joanna La Beltraneja, whose claim to the Castilian throne was disputed due to her uncertain paternity. Upon his death in 1481, he was succeeded by his son, now King John II. John married Eleanor of Viseu in 1471, and they had one son together, who died at the age of 16. Upon his death in 1495, he was succeeded by King Manuel I, a grandson of King Edward of Portugal. Manuel’s first wife had been Isabella of Aragon, the daughter and heiress of Isabella I of Castile and Ferdinand II of Aragon. Isabella died giving birth to their son, who became the heir to Castile, Aragon and Portugal but he died before his second birthday. He remarried to her sister Maria of Aragon, and they had ten children together, though not all lived to adulthood. Maria died in 1517, and his last wife was Eleanor of Austria, the sister of Holy Roman Emperor Charles V. They had one surviving daughter together. Upon Manuel’s death in 1521, he was succeeded by his eldest surviving son, now King John III. John married Catherine of Austria, a daughter of Joanna of Castile, in 1525 and they had nine children together. Most of their children died young. Their son John Manuel died at the age of 16, shortly after marrying Joanna of Austria, a daughter of Holy Roman Emperor Charles V. She gave birth to their son Sebastian two weeks after her husband’s death. Upon John’s death in 1557, he was succeeded by his three-year-old grandson, now King Sebastian I. Sebastian never married and died in battle at the age of 24. Sebastian was succeeded as King by his great-uncle Henry, brother of his grandfather, King John III. Henry had taken holy orders, which he attempted to renounce to further the Aviz dynasty. He died just two years without leaving legitimate issue, effectively ending the House of Aviz. One of the closest dynastic claimants was King Philip II of Spain, as a grandson through the female line of King Manuel I of Portugal. He took Portugal by force and was soon elected King. He had been married four times, but by the time of the Portuguese election, all four wives had predeceased him. His first wife was Maria Manuela, Princess of Portugal, his second wife was Queen Mary I of England, his third wife was Elisabeth of Valois, and his fourth and final wife was his niece, Anna of Austria. Upon his death in 1598, he was succeeded by his eldest surviving son, now King Philip II (Philip III of Spain). The following year, he married Margaret of Austria, and they had eight children together, though not all survived to adulthood. Upon his death in 1621, he was succeeded by his eldest son, now King Philip III (Philip IV of Spain). Philip had married Elisabeth of France in 1615, but of their eight children, only one daughter survived to adulthood. One son lived to the age of 16. After Elisabeth’s death in 1644, he remarried to his niece, Maria Anna of Austria, in 1649. They had five children together, though only two children survived to adulthood. In 1640, Philip was expelled by the nobles of Lisbon, ending the union of Portugal and Spain. John, Duke of Braganza, a descendant of King Manuel I of Portugal, became King John IV of Portugal. He had married Luisa de Guzmán in 1633, and they had seven children together. One of their daughters was Catherine of Braganza, who married King Charles II of England. John IV was nicknamed John the Restorer. Upon his death in 1656, he was succeeded by his eldest surviving son, now King Afonso VI. He was mentally unstable, and his mother acted as regent for him. He married Maria Francisca of Savoy in 1666, but the marriage was annulled just two years later. She went on to marry his younger brother. From 1667, his brother acted as his regent, and upon his death in 1683, his brother became King Peter II. He and Maria Francisca of Savoy had one daughter together. After Maria Francisca’s death in 1683, he remarried to Maria Sophia of Neuburg in 1687, and they had a further seven children. Upon his death in 1706, he was succeeded by his eldest surviving son, now King John V.
John married Maria Anna of Austria in 1708, and they had six children together, though not all survived to adulthood. Upon his death in 1750, he was succeeded by his eldest surviving son, now King Joseph I. Her had married Mariana Victoria of Spain in 1729, and they had four surviving daughters together. Upon his death in 1777, his eldest daughter Maria became the first undisputed Queen regnant of Portugal. Maria had married her father’s younger brother Peter in 1760, and he became King Peter III of Portugal by right of his wife. They had six children together, though not all lived to adulthood. Maria was mentally unstable. During the Napoleonic Wars, the family was forced to flee to the Portuguese Viceroyalty of Brazil, which later became the Kingdom of Brazil. Despite the defeat of Napoleon, Maria remained in Brazil, and she died there in 1816. She was succeeded by her eldest surviving son, now King John VI. John had married Carlota Joaquina of Spain in 1785, and they had nine children together. In 1825, the Empire of Brazil was proclaimed. Upon his death in 1826, he was succeeded by his eldest son, now King Peter IV and Emperor Peter I. Peter had married Maria Leopoldina of Austria in 1817, and they had seven children together before her death in 1826. He remarried to Amélie of Leuchtenberg in 1829, and he had one daughter by her. He was unable to deal with issues in Brazil and Portugal at the same time and abdicated the Brazilian throne in favour of his eldest surviving son, now Emperor Peter II of Brazil. Upon his death in 1834, he was succeeded by his eldest daughter, now Queen Maria II. This was disputed by Peter, and a compromise was reached where she would marry her uncle, Miguel. However, upon his arrival, he immediately deposed Maria and proclaimed himself King. She wasn’t restored as Queen until 1834. On 26 January 1835, Maria married Auguste, Duke of Leuchtenberg but he died just two months later. On 1 January 1836, she married Prince Ferdinand of Saxe-Coburg and Gotha who received the title of King upon the birth of their first child in 1837. They went on to have 11 children, though Maria suffered greatly under the many pregnancies. She famously uttered the words, “If I die, I die at my post.” She died in 1853 after giving birth to a stillborn son; she was still only 34 years old. She was succeeded by her eldest son, now King Peter V. He married Stephanie of Hohenzollern-Sigmaringen in 1858, but the couple had no children. He died in 1861 and was succeeded by his younger brother, now King Luís I.
Luís married Maria Pia of Savoy in 1862, and they had two surviving sons together. Upon his death in 1889, he was succeeded by his eldest son, now King Carlos I. He had married Amélie of Orléans in 1886, and they had two surviving sons together. On 1 February 1908, he and his eldest son were assassinated. His wife and younger son survived, and he was succeeded by his youngest son, now King Manuel II. Manuel’s reign ended just two years later with the 5 October 1910 revolution. 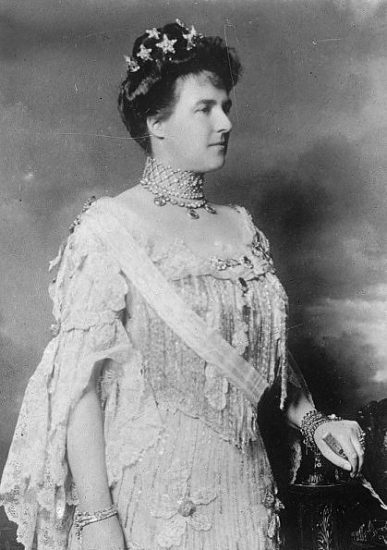 Thus, his mother Amélie was the last Queen of Portugal. Manuel married Augusta Victoria of Hohenzollern-Sigmaringen in 1913, but this happened after the abolishment of the monarchy. They had no children together, and upon Manuel’s death in 1932, his claim was inherited by Duarte Nuno, Duke of Braganza, a grandson of Miguel, who had deposed Queen Maria II. It is his son Duarte Pio who currently carries the claim to the Kingdom of Portugal.